How Are IVC Filters Removed? What if it Stays in Place Too Long? IVC filters are meant to catch blood clots before they can damage the lungs and potentially kill a patient. But putting the devices into a patient’s vein, and later removing it, presents risks of damage to blood vessels and other serious complications. IVC filters are small, cage-like devices designed to fit inside the body’s largest vein — the inferior vena cava (IVC). IVC filters are usually put in place using a long tube called a catheter that is threaded through veins or arteries. The filters are designed to catch and hold blood clots in place and allow them to dissolve naturally before the clots can cause damage. Older IVC filters were meant to be left in place. 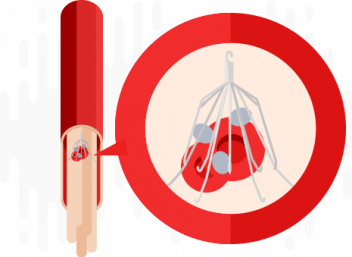 Newer designs, called retrievable IVC filters, should be removed once the danger of clotting is over, according to the Radiological Society of North America. A procedure similar to the one used to implant the filters is used to remove them. But removing the devices presents risks. The procedure may damage blood vessels, break filters or cause other complications. Doctors remove retrievable filters in a way similar to how they implant them. Health care providers inject contrast or X-ray dye around the device to make sure it is safe to proceed with the removal. A catheter-like snare goes into the vein and grabs a hook located at the end of the filter. A sheath covers the filter, collapsing its legs and releasing its grip on the vein’s walls. The doctor then pulls the catheter out of the vein, bringing the IVC filter with it. The FDA recommends that retrievable IVC filters should be removed once the danger of a pulmonary embolism has passed. This can be accomplished in most patients through anticoagulation treatment – the use of “blood thinners” such as warfarin. If a patient suffers from pulmonary embolism (PE) or deep vein thrombosis (DVT) and cannot take an anticoagulant, the IVC filter may be left in place. In the weeks leading up to filter removal, doctors reassess their patient’s requirements. Before undergoing an IVC filter removal, patients should go over their medical history, including any current illnesses or medical conditions, with their doctor. Patients should report all medications and herbal supplements they are taking as well as any allergies, especially to drugs or anesthesia. Any surgery carries risks. These can include infection or reaction to the drugs used during the procedure. In addition, IVC filters removal procedures carry their own complications. Research has shown that roughly 80 percent of IVC filters can be removed, but there are some cases where they have to be left in the body. If a filter cannot be removed, the patient may have to consider a second surgery or leave the device in. Blood thinner dosages may have to be adjusted before any further surgery, but if the filter has grown into the vein’s scar tissue, removal becomes increasingly complicated. Advanced surgery centers may be able to use a laser to remove some of these devices. In this procedure, a laser is inserted inside the catheter and sheath that would normally remove the filter. The laser burns away the scar tissue until the filter can be collapsed, collected in a sheath and removed with the catheter. What Happens if a Retrievable IVC Filter Stays in Place Too Long? Studies have shown that the longer a retrievable IVC filter remains in place, the more difficult it is to remove. It may also increase the risk of complications such as vein perforation, the filter breaking or broken parts reaching and damaging the heart, lung or other organs. Blood clots are the body’s natural response to stop bleeding. Doctors may implant IVC filters after a major surgery or accident that triggers this clotting response because they may believe a patient is at risk of suffering a pulmonary embolism. The FDA recommends retrievable filters be removed as soon as the clotting risk is over, usually after just a few weeks. But many are left in place for years. Researchers have found that 20 to 40 percent of IVC filters left in place long-term cannot be removed because they embed themselves in the walls of the vein. Illinois doctors Benjamin Lind and Hector Ferral documented a case in which they successfully removed a Cook Medical Günther-Tulip IVC filter more than nine years after it was implanted. The device had shifted, penetrating the wall of the vein and perforating the patient’s small intestine and part of her urinary tract. Because the device had been left in the patient for so long, removing it required extensive planning and a unique procedure. The doctors used multiple instruments to dislodge the filter only to find that its prongs had become attached to the wall of the vein. They finally had to insert and partially inflate an angioplasty balloon, used for heart procedures, into the vein. The doctors partially inflated the balloon on one side of the IVC filter while continuing to pull on the device from the opposite side. After considerable work, they were able to successfully remove the filter.